We’ve become used to rock documentaries being rather self-congratulatory affairs, where those involved look back with rose-tinted glasses and wallow in comforting but ultimately pretty bland nostalgia. ‘The Man From Mo’Wax’ is not like that. Far from it. The fact that its subject, James Lavelle, mentioned ‘Hearts of Darkness’, the documentary about the troubled making of ‘Apocalypse Now’, while being interviewed about this film should tell you something. He’s ultimately given the film his blessing, which is to his credit, but insists it’s only one side of a complex story. Watch the film and it’s not hard to see why he might find it uncomfortable viewing. There’s plenty here about how the Mo’Wax empire was formed and quickly became one of the key cultural touchstones of the 90s. There’s amazing footage of DJ Shadow literally crawling over piles of records in a search for new beats in a San Francisco bargain basement. The footage of Shadow jamming with Thom Yorke is fascinating too, as is similarly amazing access the filmmakers had to sessions with Ian Brown, Brian Eno and Jarvis Cocker (together!) and others. But the movie does not flinch from discussing and documenting considerably more thorny issues. Early stalwarts of the label, such as Attica Blues‘ Charlie Dark and sleeve designer Swifty, get a chance to vent about being sidelined as Mo’Wax quickly grew in reputation. Shadow is equally candid about the row over writing credits on the first UNKLE album, which led to the DJ’s departure from band and label alike, not to mention one of the most morose ‘Top of the Pops’ appearances of all time. Then there are the falling sales of subsequent UNKLE albums, Mo’Wax’s ignominious demise at the hand of a corporate record label takeover, Lavelle’s failed relationships and his dalliances with drink and drugs. We’re there every step of the way, as recording sessions implode, friendships atr tested beyond breaking point and budgets run dry. Even for the unaffected observer, it’s painful to witness, so god knows how Lavelle himself felt about re-living it all. There is redemption though. In 2015, with the help of the Southbank Centre’s Jane Beese who passionately defends his legacy here, we see our man staging the most successful Meltdown festival yet, reuniting with many of the people he’d fallen out with and properly cementing his reputation as a major player in this generation’s cultural landscape. On a personal level too, his relationship with his daughter seems like a constant rock for him to cling to, and the scenes the two share together are undoubtedly the most touching and moving moments in the whole film. 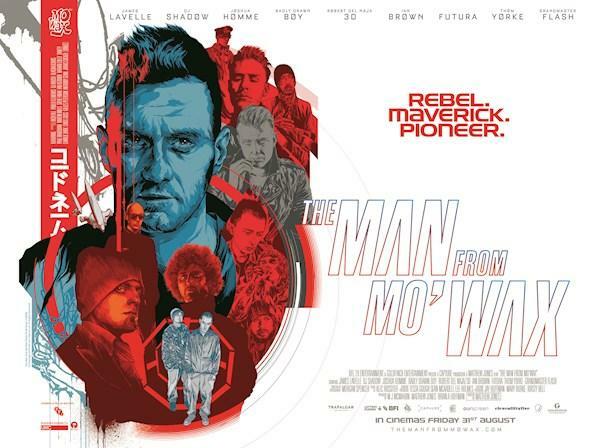 If there’s a moral or message to ‘The Man From Mo’Wax’, it’s not overtly presented as such. You might see it as the story of a perennial teenager who was finally caught by the inevitable march of time. Or an Icarus character who flew too close to the sun and came crashing down. Or simply a driven artist whose fierce focus on realising his grand visions has taken its toll on other areas of his life. You’ll have to make your own when you see it. The fact that it doesn’t seem to hammer home one central narrative agenda over another, while never shying away from telling the warts-and-all truth, is the icing on the cake. If the names James Lavelle and DJ Shadow mean anything to you, then this is a must see movie for you.